Adobe has announced new versions of its Elements line of consumer digital photo and video software -- Adobe Premiere Elements 7 and Photoshop Elements 7, due to be released in October. Adobe has worked diligently with each release to make these applications consumer-friendly, while still retaining significant strength and capability from the underlying professional Premiere Pro and Photoshop CS tools. Adobe describes these as the best-selling consumer video- and photo-editing software. 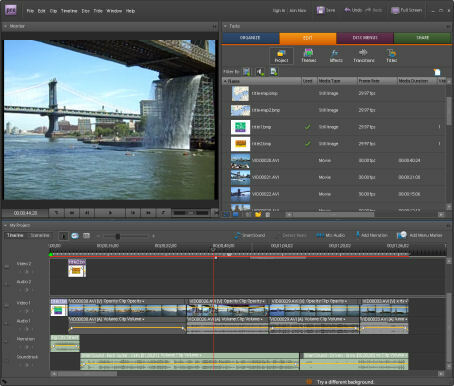 With Adobe Premiere Elements 7, Adobe has focused on powerful technology assists, and integrating with online storage and sharing though Photoshop.com. For example, the new Smart Tags technology extends the technology used for scene detection, quality analysis, and face detection to automatically analyze clips and assign a variety of attributes. But the big news in this release is the integration with online access though Photoshop.com. The desktop Premiere and Photoshop Elements 7 applications can push photos and clips to online storage on Photoshop.com, so you can share and access your media from any Web-equipped computer. Changes you then make in the online Organizer then are synced back to your desktop. Photoshop Mobile also can sync photos from a cell phone to your online storage, and from there to your desktop. Basic Photoshop.com membership is free, and Plus membership for $49 per year offers additional online storage, automated backup, and regular updates of creative elements for the desktop applications. The pricing is unchanged: Premiere Elements 7 is $99 list, or $149 bundled with Photoshop Elements 7. See my full article for a summary of new features and enhancements, plus a visual tour of the Premiere Elements 7 interface and features. The Premiere Elements interface is bright without being garish, with a muted background to help the images stand out clearly, and with clearly-identified tabs for the key editing tasks and dedicated buttons for common functions. You can start quickly by dragging clips to assemble a movie in the storyboard, drag and drop apply transitions and effects, and refine the clips and add titles by working directly in the Monitor window. But underneath there's also a timeline view with multiple overlapping tracks of audio and video (and not limited to just a few of each), plus serious features including transitions and effects with multiple controls and keyframe animation. The key new technology in Premiere Elements 7 is Smart Tags. The software not only can split clips into scenes, but it also automatically analyzes clips to assign a variety of attributes, including Audio, Blur, Bright/Dark, High/Low Contrast, Shaky, Quality, Motion (pan / tilt / zoom, direction) -- and even detecting Faces (single / multiple, closeup / long). You also can use the new Tagging window to apply your own tags and star ratings, organize clips into albums, and create Smart Albums that automatically collect clips based on defined criteria. Then use all these attributes to quickly collect and find desired clips in the Organizer window. These attributes are also used by the InstantMovie option to automatically assemble a movie from a collection of video clips. This selects and trims clips using Smart Tags and user ratings, and adds music, titles, effects, and transitions -- based on themes including birthday, wedding, music video, extreme sports. Advanced users then can further edit the result, if desired. The Videomerge technology automatically composites video green-screen overlays by extracting a moving subject from a solid color background to overlay into a new setting. Premiere Elements 7 also now supports import and editing of high-def AVCHD video, and generates SmartSound soundtracks to automatically adjust to match the length of movie, also automatically detecting music tempo and to sync to the beat. This entry posted on September 1, 2008. Previous: Sony Vegas Movie Studio 9. Next: Watch Out: Logitech WiLife Video Security System.